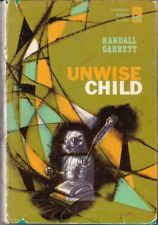 Remarkably prolific, Randall Garrett was primarily a fantasy short-story writer and is probably best known for his Lord Darcy series, a collection of alternate world stories which appeared in pulp magazines from the 1960s through the late 1970s. Recounting the adventures of a Plantagenet detective in a twentieth century world filled with magic that really works, the stories are filled with jokes and references to spy stories and to detective fiction in general. Randall loved puns and word plays, and was as much of a Falstaffian character as any of those that he wrote about. He wrote three other series of fantasy and science fiction stories (the Gandalara Cycle with Vicki Ann Heydron, the Nidorian series with Robert Silverberg, and the Sweet Little Old Lady series with Larry M. Harris), plus three novels, and a large number of non-series short stories. He also wrote a handful of "Poor Willie" tales, a bunch of hilarious parodies, and some poetry. At least one of his poems, "Oh No, John!" (about the literary tastes of Astounding Science Fiction editor John W. Campbell) was set to music, and I remember sitting in hotel corridors late at night with a group of other aficionados, singing it while author David McDaniel played the guitar. Randall's first published story was Probability Zero in 1944 and a wealth of tales followed. It's rather hard to tell exactly how many there were, because they were published under at least ten pen names – including David Gordon, Alexander Blade, Ivar Jorgensen, and Gerald Vance. He wrote under pseudonyms primarily because his output flooded the available science fiction and fantasy markets, to the point where he often had two or three stories – under different pen names -- in the same magazine. Bibliographers still occasionally turn up stories that they think might be by Garrett but can find no proof one way or another. He was a tall, dark, rather heavy-set man, and was always good natured and jovial. When I first met him, he used the diminutive of his first name, but when he abandoned that for a more dignified appellation, one of his favorite quips was "Randy I may be, but Randall is my name!" I remember drinking with him and some others at a science fiction convention in Phoenix, Arizona where the convention was too large for one hotel and occupied blocks of rooms in two adjacent ones. Both hotels had bars set up in their outdoor patios, under shade canopies, and there was a good flow of fans and pros between the two locations. Randall ordered a round of drinks, flashed his room key at the bartender, and signed the chit. Unfortunately, as I realized a few moments later, we were not at the bar that belonged to the hotel where he was registered. I hope that the hotels straightened it out. That was during the era when wigs were fashionable for women and a lot of us traveled with one or two on convention jaunts, to keep from looking too frowzy during the course of a three (or even four) day con, especially when the trip was by car and sometimes from the Pacific to Atlantic coast. I was at one convention, talking with Randall and a female friend of his, when I realized that I had forgotten to fetch some papers from my hotel room. Still talking, all three of us went upstairs. When we got to my room, Randall spotted my wig sitting on the bureau and chivvied his friend into trying it on. We agreed that it wasn't her style. Whereupon Randall tried it on too. It didn't suit him either. He enjoyed parties and he loved costumes. One time he came to a convention masquerade dressed in tights and doublet as a character from one of his own stories. (That was before there were costume competitions. The event was a costume ball; there was recorded music for dancing and attendees mingled together in a wonderfully exuberant kaleidoscope of science fiction and fantasy.) After the event, when we were socializing at a room party, Randall announced that he was leaving for a few minutes to get into more comfortable clothes because, "Unlike the hotel, this costume has no ballroom!" I had not seen Randall for a year or so before I ran into him at a convention in Los Angeles and we sat down to catch up on our respective lives. He had been ordained as a priest by then, and told me a charming tale about going to an early morning service in a New York church. The officiating priest of the large church cast a practiced eye over the assembled worshippers, estimated the number of people who would receive communion, and poured a very generous measure of wine into the communion cup. Much to his horror, only four people – including Randall in a black suit and a clerical collar – stepped up to the communion rail. When he got to Randall, who was at the end of the line, he had a nearly-full cup of consecrated wine and in a conspiratorial whisper pleaded, "Help me kill it!" I asked Randall why he had become a priest. He hadn't led what I would call a dissolute life, but it had been a hearty one and he had, I think, gotten a great deal of worldly joy out of it. When I put the question to him, he replied simply, "I heard the Call." There is no response to that. Randall contracted encephalitis in 1979. That was the end of his career. I heard from mutual friends that he was ill, but did not realize how serious it was. He was admitted to a facility in Texas, and a friend of ours who was driving from Los Angeles to the East Coast stopped by to see him. It was too late. He no longer recognized friends or remembered the past. He died in 1987, at only sixty years of age. I hope that he passed, at the end, into a hearty Summerland of wine and laughter.